This photo essay features the, "Brown & Segner Company," headquarters building. 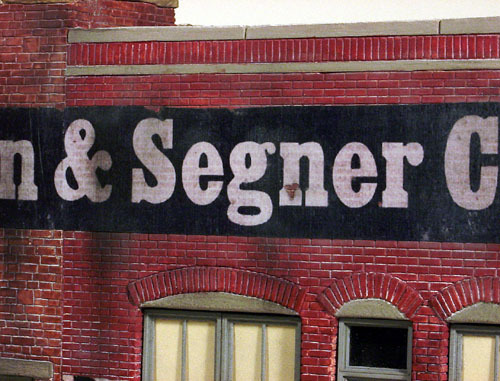 The building on my C&TT RR layout was named in honor of two fellow Sn3 modelers, Jim Brown and Russ Segner. 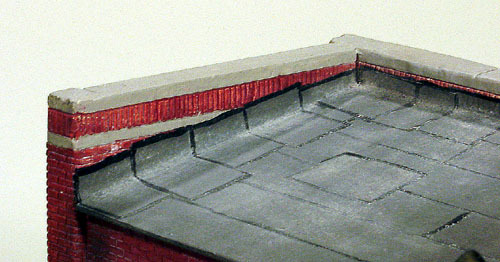 The plaster kit was originally created by Roger Malinowski and released in 1997 at the Narrow Gauge convention in Cincinatti, Ohio. Roger's "O" scale version was named, "Stoney Creek Sheet Metal." The "S" scale version he produced for Bill Banta's, Building & Structure Co. was called, "Light Industrial Building." This first photo shows the front face of the new building. The front wall of both of the buildings is one casting. There's an inner wall between the two however. Once the walls were cemented together with white glue and reinforced with inner corner blocks, the entire structure was sprayed, inside and out, with Krylon's satin finish, "Almond Satin". 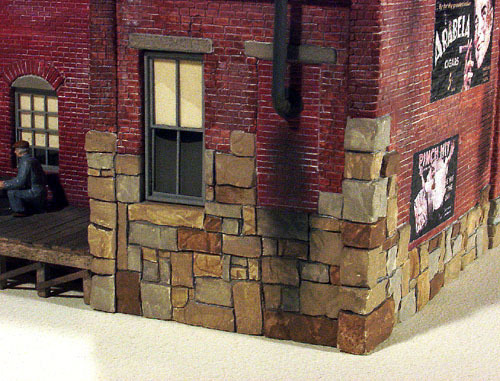 Polly Scale "UP Harbor Mist Gray" was used on the doors and windows and liquid acrylic craft paints were used on the rest of the structure. The stones were colored with earthtone shades while Light Red Oxide and Burnt Sienna were used to color the bricks of the individual buildings. The posters were supplied on a printed sheet with the kit. They were trimmed and thinned by wetting their back sides and carefully removing the paper backing with the point and edge of an Xacto knife blade. When I reached the back side of the ink layer, I knew I had gone far enough. They were then secured in place with diluted white glue. 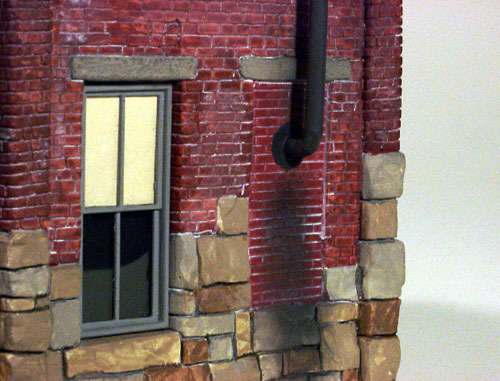 This view features the coloring of the cap stones used on the walls, the stove pipe coming from an old bricked up window and the loading dock at the rear of the building. 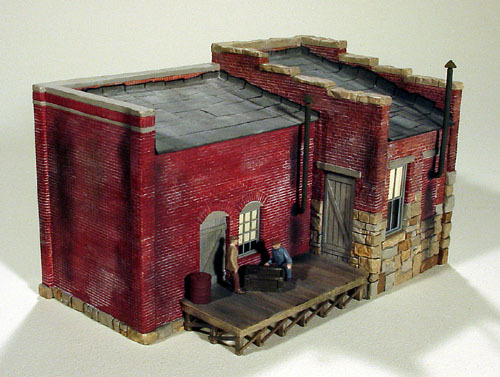 In this view of the rear of the building, I've added a few items to the shipping/receiving dock along with two figures. In this closer view of the front, you can see the darkened interior of the building. Rather than removing the thin "skin" of plaster remaining on the casting after it was poured, I left it in place and painted it black. 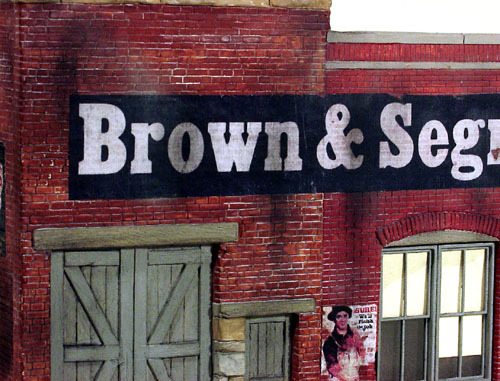 The "Brown & Segner Co." sign was created with Adobe Photo Shop LE as a 60" x 15" drawing, then reduced to 6.5" x .75" and printed on matte surfaced paper with an ink jet printer. Creating it initally at the large size produced smooth curved letters rather than ones having the "jaggies". The front of the sign was sprayed with Krylon Matte Fixative for protection. I then sanded the back surface with a sanding stick until I had reached the ink layer. The back side was then sprayed with several coats of the Matte Fixative again, and when dried, it was cut away from the carrier sheet and attached with diluted white glue. I pressed on the surface of the sign with my finger to squeeze out any excess glue and to also force the thinned paper into the embossed brick pattern. 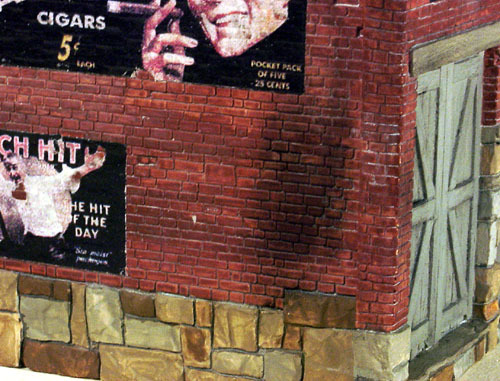 When it had dried, I cleaned the surface of the sign and the surrounding bricks with a dampened cloth to remove any remaining traces of glue. 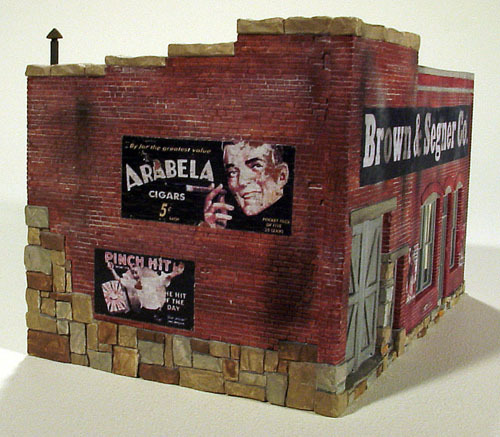 After the brick paint had dried, I added the mortar with a very diluted wash of white craft paint. Once the surface was dampened with the paint, I lightly dabbed extremely small amounts of full strength white paint into the wet areas and allowed it to spread. 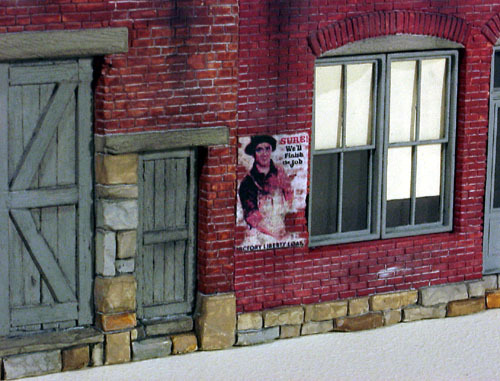 By varying the placement of these, "dots," of paint, I was able to create a random weathering pattern. 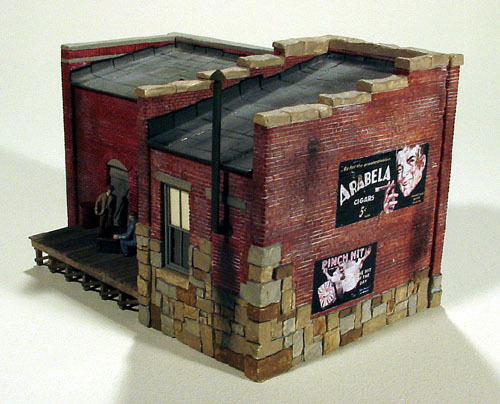 Additional weathering was created with powered artist chalks. Black, gray and some rust colors were brushed into various areas with a medium tipped Max Factor make up brush. After removing the parting lines from the metal stove pipe castings with a knife and sanding stick, they were painted with Polly Scale, "Tarnished Black", then washed with my rust ladened vinegar/steel wool solution. I punched out two holes in writing paper with a paper punch and used an awl to help center the tiny round disks while they were glued over the two holes I had drilled through the walls earlier for the stove pipes. The paper rings were carefully painted, "Tarnished Black", and when dry, their holes were filled with 5-Minute Epoxy and the metal pipe castings were pressed into place and aligned. 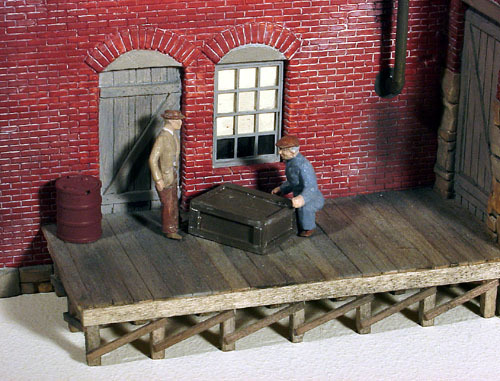 The loading dock was constucted differently on this model. Instead of using stripwood exclusively for the frame construction, I used a piece of untempered Masonite that had been cut and shaped to fit the area of the dock. Holes for the supporting posts were marked off and drilled to a size where the square post stripwood would just fit through the round holes. Two pieces of strip wood were then glued to the two visible edges of the Masonite. When the glued in posts were secured, diagonal braces were added. This component was epoxied to the rear of the building and pre-stained strip wood decking was attached to it's smooth surface with white glue. 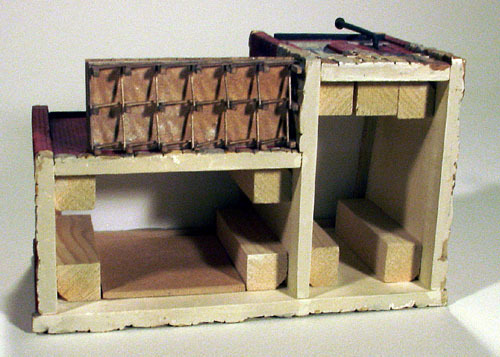 While the building is turned upside down, notice the internal bracing. Since I wasn't going to create an interior, I used 3/4" square wood for the corner braces. When the white glue that had been used to hold the plaster walls together had dried, I attached these large wood pieces to give the structure added strength. A scrap of the Masonite material was glued behind the plaster window, "skin," areas to prevent it being damaged during construction. Because the plaster walls were formed in a flat mold, the brick and stone detail had to be carved into their back sides. This step was completed before the wall units were glued together. 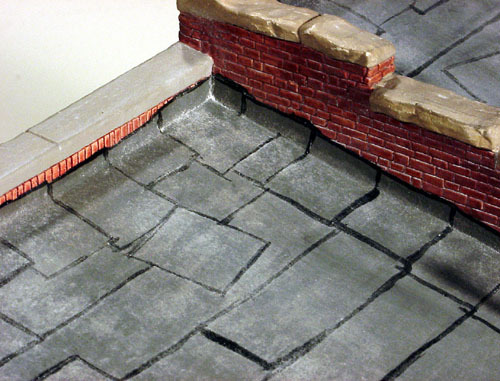 The new brick and stone lines were carved using a straight edge, carbide scriber and the back side of an Xacto knife blade. 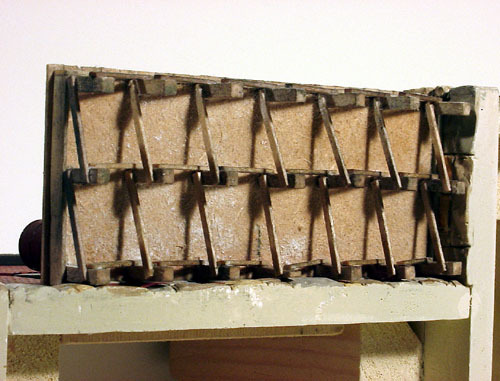 Thin pieces of square stripwood were glued to the inner sides of the walls to support the styrene roof panels. Prior to installing those panels, I sprayed them with 3-M Super 77 Adhesive and applied pieces of tissue paper to represent scale 3' wide rolled roofing paper. The tissue covered panels were then epoxied to the strip wood supports and short pieces of the tissue were glued in place and allowed to lap up onto the vertical wall surfaces creating a flashing effect. Additional signs of water proofing were created by painting all the seam lines with glossy black Pactra acrylic paint. 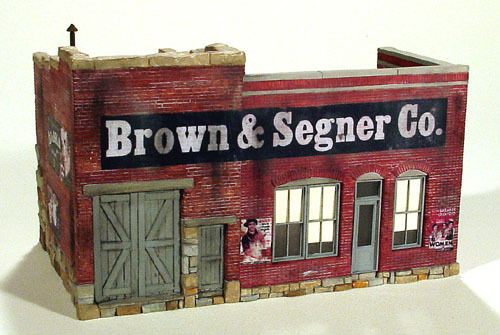 The final photo shows both the Brown and Segner partners on the loading dock discussing the days business.